For re-sealing green and black modulators on most 1981 to 1993 models. If your modulator is working ok, but leaking transmission fluid, you may only need to replace the inexpensive oring ( o ring ). You do have to be careful when removing the modulator from the transmission. For instructions (available separately) see related products below. This is becoming one of the common transmission fluid leaks on these older automatics. If the trans is leaking fluid in small puddles while the car sits for longer periods suspect this seal. You can be fooled thinking it is coming from the pan gasket. Genuine Mercedes special Oring seal for the bowden cable housing where it connects to the right side of the automatic transmission. 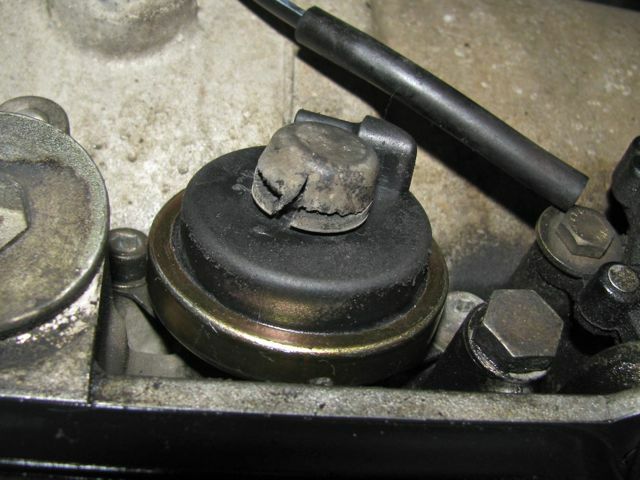 This is a common leak area and you may be fooled into thinking it is leaking out of the pan gasket. The bowden cable runs from the transmission to the throttle linkage on many Mercedes from the early 1980's up through the early mid 1990's. When this cable fails or is out of adjustment the transmission will either shift too early or too late. If you are experiencing very hard or less than perfect shifts, a failed transmission modulator could be the problem. New Genuine Mercedes part. This unit is an upgrade over the original. It has a better thrust pin design which is less prone to cause pressure variations in cold weather. This guide will explain how to properly change the fluid and filter in your late 123, 126, 201, 124, late 107 chassis Mercedes as well as early 129 and 140 chassis. This includes model years from 1982 to 1993. Brand new gasket. Make sure this fits your transmission before ordering. No returnable if ordered in error. Turbo models 1982 to 1985 300D 300CD, 1981 to 1985 300TD, and 1982 to 1983 240D. New rubber mount that bolts on rear of transmission. Failure of this part can cause excessive engine vibration. Common failure item. Fits models listed above. NO INSTRUCTIONS INCLUDED. Single mount only no bolts or nuts included. For Late 123 and 126 chassis 1981 to 1984 Turbo transmissions only - Other models coming soon. This is the most complete front reseal kit on the market today. It includes Kents new IMAGE-BY-IMAGE instructions. That means there is an image for every single step in the operation of replacing these 2 (Yes there are 2!) critical front seals. NEW Genuine Mercedes Modulator Cap. Check to see if yours is cracked. Cap removal is required for modulator adjustment. If you are going to pull your transmission to replace any clutch components you should do it right! That means replace all key wear components so you don't have to remove the transmission again any time soon. Go with the best brand parts so the repair will last the longest. If you are going to pull your transmission to replace any clutch components you should do it right! That means replace all key wear components so you don't have to remove the transmission again any time soon. Go with the best so the repair will last the longest. That means genuine Sachs parts. Common diesel transmission leak source. These aluminum washers fit on each side of the banjo connection where the oil cooler lines bolt to the right and left front side of the transmission case. Fit 300D 300TD 300CD and 300SD with automatic transmissions from 1981 to 1985. New Genuine AT transmission pan. Fits most TURBO 123 and 126 diesels 1982 to 1987 with the exception noted. WARNING: Will not fit 1985 models particularly California. If you have a 1985 model we do not carry pans for that particular transmission. Suggest you contact a Mercedes dealer. Brand new Genuine OEM turbo diesel kickdown switch. Fits 123 turbos from 1982-1985 and 126 turbos from 1981-1985. This switch is located under your accelerator pedal, and it tells the transmission when to down shift. If the switch breaks it can stick in or on! These are no longer available new. WARNING: DO NOT purchase this item to correct a shift problem unless you are ABSOLUTELY CERTAIN this it is the problem. There could be a number of other vacuum related issues that can cause hard or soft shifts. New clutch release hydraulic slave cylinder for later model 123 chassis 240D. This is the unit that mounts on the right forward side of the transmission. Be sure to check your vin number before ordering. This one fits up to the following vin number 123.123 - from 219675 . Brand new Gemo Speedometer cable for all 5 cylinder 123 Chassis Diesels from 1977-1981. If any question that this single length cable will work in your car please measure your existing cable. This one measures 1460 mm. This only works on non-turbo automatic transmissions.